Series of object photos are used for automatic creation of 3D object model. Off-the-shelf cameras or smartphones used instead of 3D scanners. Reconstructs point clouds, generates meshes, performs texture mapping. Resulting models can be stored in widely supported file formats. Available as an SDK that supports multiple programming languages. SentiSculpt technology is designed for rapid creation of 3D object models from series of 2D images. The generated models are suitable for wide range of applications, including virtual or augmented reality, video games creation, 3D printing, computer aided design, architecture etc. The object size may range from a small toy to a large building. Converts series of photos into 3D model. SentiSculpt needs series of object photos, which are made from different angles. Each photo is analyzed by the advanced computer vision algorithms, and certain features of the object are captured for the point cloud creation. See the recommendations and specifications for the photography-related details. Common camera required. The photos for the 3D object model reconstructions can be made with an off-the-shelf camera or a smartphone. A tripod can be used for improving photography quality. The optimal model creation performance needs 2-5 megapixel camera resolution. The recommendations and specifications contain more detailed information about camera setup. Automatic images processing. Common 3D model creation may need many hours of work by a trained designer. SentiSculpt algorithm provides simple 3D model creation workflow and does not require advanced skills, as its input is usually a folder with images. The algorithm analyzes each image, recreates the shooting angle, extracts the necessary features and adds them to the object model. Advanced 3D model creation. The technology performs several steps of object model creation. A point cloud is created at first. 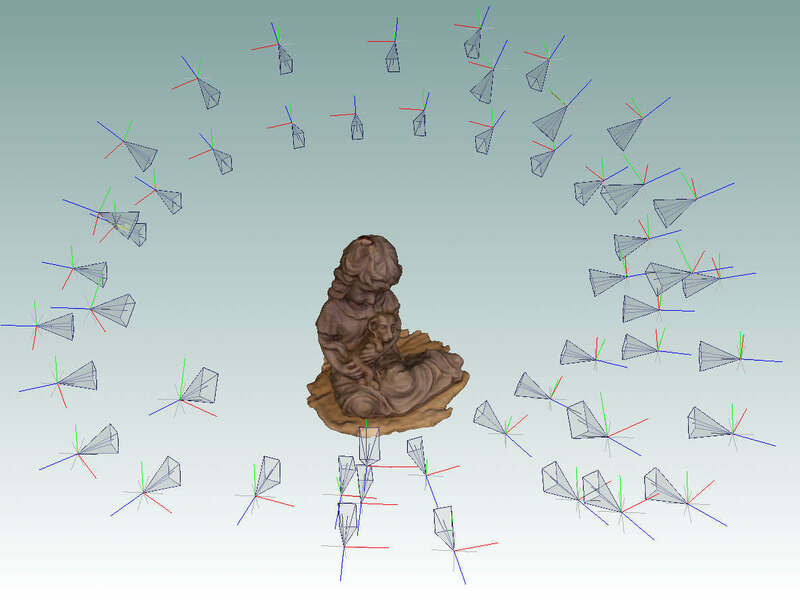 A mesh (wireframe model) is generated based on the point cloud. A texture is recreated from the captured object surface and applied to the generated model, so the final model has realistic look. 3D model export into widely supported formats. SentiSculpt allows to save the generated object model in widely used file formats so the model can be used by most 3D graphics and CAD applications.